Today just two shots of my latest addition to the maternity wardrobe - a simple linen skirt. I used an old skirt that I loved and that almost still fit as a pattern and added an inch or two for ease. 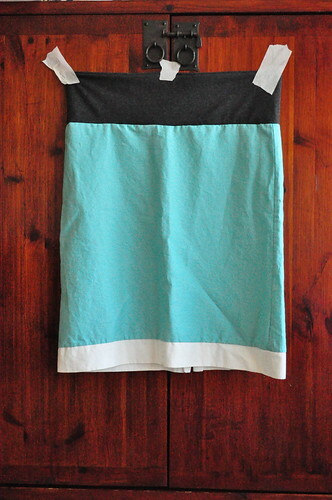 Instead of a button or zipper I added a typical maternity stretch waistband. 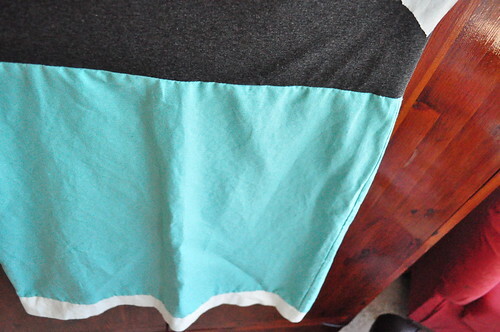 The fabric for the skirt is Robert Kaufman Essex Linen (a 55% Linen, 45% Cotton blend) in colors Aqua & Linen. It was really easy to sew. After the first wash it had a really nice texture to it and I loved how it looked like - no ironing necessary. I was just not so smart to fold it up and put it on top of my dresser to wait for it's turn in picture taking... sorry for that crappy fold in the middle of the skirt. As for the waistband - I am not sure what it is, I told the lady I wanted fabric that is used for maternity waistbands and she answered back in Hebrew 'ah, spandex' and showed it to me. It has a cotton feel to it though so i think it's a cotton knit with a higher amount of elastane added. Sometimes fabric shopping here is quite adventurous since I have yet to find a dictionary that lists all fabric names, usually it sounds somewhat familiar to English or German terms, but sometimes it's not used in the same way - similar to the different use of "Muslin" in UK/USA.